Late on a March evening of 1286, Alexander III, king of Scotland, had already had a full day. He had met with his council in Edinburgh and afterward, they adjourned to a lengthy and "convivial" supper. As they talked and, presumably, drank, a gale set in. Outside, winds from the north howled across the Firth of Forth, bearing snow. No night for man or beast to venture out. But the king's new young wife was in Kinghorn Castle, on the east coast of Fife. To get there, he would have to cross the firth in a boat and then ride on horseback to the castle on a cliffside path of uncertain footing. Still, he was determined to sleep in her bed before the night was over. What mixture of lust, love, bravado, or wine made him so insistent we'll never know. Lust may be the winner, for the chronicles report that after the death of his first wife, "he used never to forbear on account of season nor storm, nor for perils of flood or rocky cliffs, but would visit none too creditably nuns or matrons, virgins or widows as the fancy seized him, sometimes in disguise." The king himself was not old. At forty-four, he was in his prime and had ruled Scotland for thirty six prosperous years. (The illustration is of his coronation.) His tragedy was that he had lost his reportedly beloved wife and all three children. So that night, five months after his latest wedding, there was no immediate male heir to Scotland's throne. Instead, the nobles, grudgingly, had agreed to his granddaughter, the infant "Maid of Norway" as the heir presumptive. Several of them disliked naming a girl. Others felt their own claims were as good or better, but in the end, they were perhaps persuaded by the fact that Alexander had plenty of time to produce another son and heir. Did that add any urgency to his desire to bed his bride? His queen, variously called Yolande or Joleta, twenty-three, was French, and descended from the Capetian dynasty. Her father was a vassal of Edward I of England. I found no description of her, but something drove the king to face a howling gale to be by her side. He had many opportunities to turn back. First, the boatman refused to take him across the Firth, but changed his mind not because of a royal order, but because he was called a coward for refusing to sail. After crossing the water, the king had another chance to change his mind. Those with him urged him to stay at Inverkeithing overnight and ride on to the castle the next day. Again, he refused. What happened then we don't know exactly. Did he, impatient, ride on alone? Or was he separated from the others by the wind and snow? Somewhere on the treacherous path, his horse must have lost his footing, for the king's body was found the next day, at the bottom of the cliff where he had been thrown, or fallen, from his horse. Scotland's Golden Age was over. 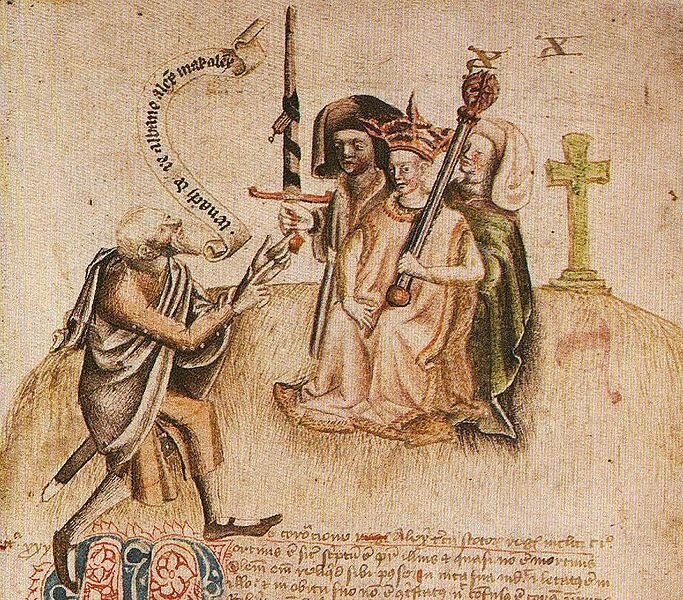 The last of Scotland's Celtic kings, dead. None of the accounts suggest foul play, and given the state of the succession, there seemed no motive for it. After his death, there was another chance, even two, for an orderly succession to the Scottish throne. First, his current queen was thought to be pregnant, but that was either a false alarm or the child died before term. Next, as agreed, the Maid of Norway was confirmed as Scotland's monarch, but she died at the age of seven, "seized by an illness at sea," shortly after landing on the Orkney Islands, still owned by Norway. Again, no foul play was suspected. She was in her father's ship and accompanied by Norwegians on the voyage. Thirteen claimants came forward to take her place. Edward I of England was invited to determine the rightful inheritor of the Scottish throne. John Balliol, Robert the Bruce, William Wallace, and hundreds of years of the Wars of Independence follow. All because Alexander had no more sense than to stay inside during inclement weather. Blythe Gifford has written five, 14th century medieval romances for Harlequin Historicals featuring characters born on the wrong side of the royal blanket, most recently HIS BORDER BRIDE in May 2010. The Chicago Tribune called her work "the perfect balance between history and romance." She is working on her next book, which will again be set on the Scottish Borders.